Make learning times tables a fun activity with origami chatter boxes. They are also called fortune tellers. This video shows a blank version being folded. This video shows a printed version being folded. Download similar completed template files below. 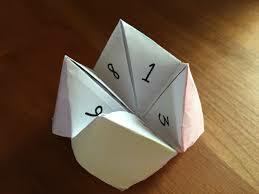 They are all pdf documents which you can fold to make the chatter boxes. If you use these in your lessons let us know the best way to use them. Discussion is in the forum.